Baltimore Sun columnist Rob Kasper lamented today's Opening Day loss of his hometown Baltimore Orioles to the Tampa Bay Devil Rays. And a keening lament it could have been, 6 to 2 being the score. But Rob did have reason for rejoicing: a choice of good beers in which to drown his sorrows. In his post, he only mentions a few, but Camden Yards indeed offers many choices of local beers. As I've wailed before, the Washington Nationals proffer only one bottled local beer and no local draft. The stadia of the Orioles and the Nationals are fewer than 40 miles apart along the Baltimore-Washington Parkway. But they are worlds apart in terms of supporting local beer. Big out-of-town breweries can pay the big bucks. Yahoo Inc is introducing a new media site focused on women's daily lives, the latest in a string of sites that include ones for gadget enthusiasts and food lovers, the company said on Sunday. The Sunnyvale, California-based company said the new site, called "Shine," offers nine categories ranging from Fashion & Beauty to Parenting. It syndicates material from popular lifestyle publishers including Conde Nast and Hearst Corp. Nothing yet on beer. Send in your CVs! The National's Ryan Zimmerman hits a walk-off winning home run against the Atlanta Braves in the bottom of the 9th inning last night. Now, that's the way to dedicate the new ballpark. 3-2. I didn't make it to the game but listened to the excellent radio play-by-play with Charlie Slowes and Dave Jageler at 3WT at 1500AM. To listen on-line, however, you'll have to pay Major League Baseball. The Nationals Journal blog is here. Most postings are by the Washington Post sports beat writer Barry Svrluga. Did you know that Bass has been brewed by ... Coors? Under license, that is. It would be a safe wager that most Americans wouldn't know. The giant American brewer Coors, owner of the former Bass breweries in Burton-on-Trent, plans to axe its visitor centre and brewing museum in the town on the grounds of cost (see previous blog and main website) -- but runs a highly successful brewing museum in Denver, Colorado. A report in the Rocky Mountain News reveals that Coors, based in Golden in Colorado, is updating the brewing museum to use state-of-the-art technology in order to attract even more visitors to the facility. It seems clear that Coors is more committed to a museum in its home state than to the former Bass Museum it inherited in Burton. ... from Roger Protz, the 'other' British Beer writer. Read the rest of Protz's post here. It raises an illustrative warning about breweries that increase their market share at the expense of their profit-to-cost ratio. While many US craft breweries have raised their prices this year, many of the big companies have not. They hope to make their beers more attractive, price-wise, in the downturning economy. How long can they maintain that small and diminishing margin of profit in the face of rising costs? How long can we small breweries survive at our higher prices versus theirs? Rick Lyke—at his otherwise informative blog—recently got it partly wrong when he noted that a bill had passed the Maryland Senate that would allow grocery and convenience stores to sell hard cider and malternatives (sweet soda-pop-like alcohol products such as Mike's Hard Lemonade or Smirnoff Ice). No grocery stores or convenience stores in Maryland may sell liquor; and only one store per any particular grocery chain in the state may sell beer and wine. The proposed law is a tax thing. It would maintain the rate on malternatives at the same level as on beer, rather than increasing it to that of distilled spirits. Most malternatives begin as beers of 4-6% alcohol by volume, then are filtered to the nth degree and dosed with artificial flavorings. Many ciders, often flavored as well, fall into the same alcohol range. A number of lawmakers and county public health directors also opposed the measure [taxing malternatives at the same rate as beer], saying the products are marketed to teens and should not be afforded the wide distribution or lower taxes of beer. Supporters noted that most other states allowed this classification and that the products had roughly the same percentage of alcohol as beer. The bill passed in the Senate, 36-10, and is scheduled to be heard Tuesday by a House committee. And while I'm at it, isn't someone, who misrepresents his or her age when attempting to purchase alcohol, committing fraud? Shouldn't penalties be divided between the seller and the buyer? a service for friends, family, and co–workers to communicate and stay connected through the exchange of quick, frequent answers to one simple question: What are you doing? Saturday, on Twitter, you could have followed my day of beer sales. It's a generational thing, I know, but I don't see the value in this. Real life intervenes. Even a younger friend, who is aghast that the brewery doesn't have its own MySpace page, doesn't Twitter ... yet. 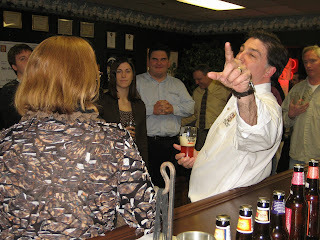 Maybe I could Twitter a ticker's record at a beer tasting, and then review it afterward for a sober blog entry. But in any case, until then, I'm officially un-Twittering. Now, back to downloading The Complete Riverside Recordings of Wes Montgomery. Your Opening Night local beer lineup. What beers will be available at Nationals Park? Having asked this question about 4,000 times--"you've got a one-track mind," Stan Kasten told me this afternoon--I finally got the answer today, during the free-food tour of Nats concessionaires. No, there were no beer samples. Domestic drafts ($7.50): Miller Lite, MGD, Budweiser, Bud Light. High-end drafts ($7.50, smaller pour): Guinness, Bass, Stella Artois, Blue Moon, Sunset Wheat, Home Run Ale (Leinenkugel), Pilsner Urquell, Peroni, Yuengling. Local bottles: Hook & Ladder Lighter. I wish that the Nationals and their concessionaire — Centerplate — had shown more of a reach-out for local beers. A short road trip up to the Orioles Camden Yards — less than 40 miles north of Nationals Ballpark — would have demonstrated to them the robust Virginia/Maryland/DC beer business community. Congratulations, nonetheless, to Rich Fleischer and his company—Hook and Ladder—and a heartfelt appreciation for them securing a toehold for craft beer in the new Nationals ballpark. I'm sure most of you know who Michael Jackson, the BeerHunter, is. Perhaps you may not know today, March 27, 2008, would have been his 66th birthday. Michael was a great friend of the Brickskeller and one Diane and I are honored to have considered a good friend personally for 25 years. [...] go to your favorite pub tonight and raise a glass of good beer to his honored memory ... [or] respect this as a special enough occasion to warrant the popping of a favorite top you've been stashing in your vault. While Michael may have passed, his contributions to the world of beer and the foundation his writings laid for all writers to build upon and all brewers to aspire to will live and grow forever. A friend and I toasted Mr. Jackson with an oak-aged Dominion Millennium, vintage 2005. Sunday 6 April, I'll be at the Classic City Brewfest in Athens, Georgia, representing Clipper City Brewing with a firkin of Loose Cannon Hop3 Ale, and samples of our spring seasonal Red Sky at Night Saison and of our year-round Uber Pils, Small Craft Warning. 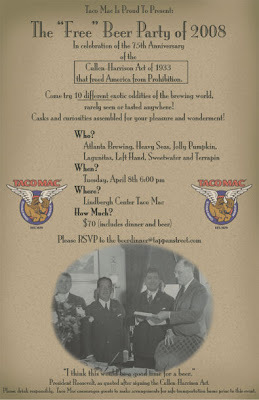 Tuesday 8 April, I'll be at the Taco Mac in Atlanta, celebrating 75 years (+ one day) of legal beer in the US. 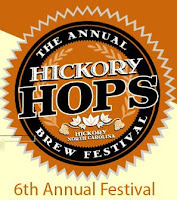 Saturday 12 April, I'll be visiting Hickory, North Carolina for the Hickory Hops Brew Festival. It's the town's 6th annual, but the first-time for Clipper City Brewing. I'll be pouring from a firkin of Loose Cannon Hop3 Ale and samples of our Red Sky at Night Saison. Hickory is mid-way between Raleigh Greensboro and Asheville. Ever since the late great Michael Jackson (whose birthday we celebrate tomorrow) commended craft brewers in the US for brewing the best beers in the world, some of us, in a self-congratulatory manner, have occasionally overlooked the bigger picture. A good beer culture is not only the liquid but also local pride and national zeitgeist. Evan Rail is author of Good Beer Guide: Prague and the Czech Republic. In a recent blog, Rail mused about what he considers the true measure of a beer culture ... from his vantage point in the Czech Republic. a country’s beer culture shouldn’t be measured by the achievements of its best beers. Instead, I’d argue that a better way to take the pulse of any beer culture would be to look at its worst beers. Just how good are your supermarket generics? How good is the beer served at sports events? What do the masses drink? Sure, America may have Surly Darkness and an army of outstanding craft brewers producing more variety than any other nation on earth, but the fact is that most people there drink Bud Light. In its history and achievements, Germany’s beer culture is outstanding, but if I had to drink mass-produced German pils for the rest of my days, it wouldn’t be a particularly long ride before I died of thirst, if not boredom. It’s true, there’s not a huge amount of variety in Czech beer culture, at least not by American standards, though there certainly is much more now than just a few years ago. Regardless, our good beers are generally excellent, just as the good beers are in any beer culture. The difference? Our bad beers are often quite good, too. Fred and the troupe at Atlanta's Taco Mac have invited Clipper City Brewing to participate in their celebration of the 75th anniversary of the return of beer to America. Well, actually one day late. It's the NCAA Championship game on Monday 7 April, so we'll be doing it on Tuesday, 8 April at 6pm. 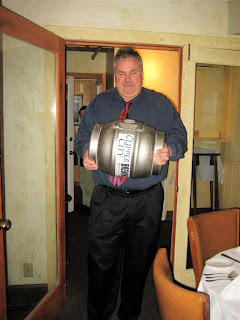 I'll be bringing 2 firkins: a cask of Below Decks Barleywine 10% alcohol by volume (a.b.v.) 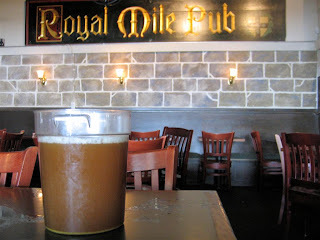 and a cask of Loose Cannon Hop3 Ale (7.3% abv). The former has been resting since the end of October 2007; the latter will be sparkling fresh. Our cellarman racks it this coming Saturday. These are strong beers. So it's a delicious irony that what was made legal 75 years ago were beers of 3.2% abv or less! Read historian Bob Skilnik's post on what really happened that day. Prohibition itself—the 18th amendment—was not repealed until the passage of the 21st Amendment on 5 December 1933. The event will feature 10 beers, some rare, from 7 breweries, and a buffet dinner. The celebration begins at 6pm (remember, it's Tuesday 8 April) upstairs at the Taco Mac in the Lindbergh Center. The cost to attend is $70 and reservations are required. Food should please the eyes as well as the stomach. And beer should as well. Beer is, after all, a foodstuff. It's made from grain, just as is bread. If you were to bake a loaf of bread tonight, would you wait to consume that lovely, redolent loaf ... for 6 months? No! Treat your beer with the same love and respect. Drink it Fresh. That's THE meme of beer. I've blogged before about the Trojan Horse strategy of the big boys. Large corporate breweries will create a marginally more flavorful beer than their standard fare but package it as if it were a craft beer (read: small and independent brewery). Blue Moon, for example, sells well for Molson/Coors, in part because it's disguised as a craft beer—including its higher 'craft-beer' price. Sometimes it's disguised as an imported beer, such as Killian's which was a popular item on Saint Patrick's Day, even though brewed by Coors in Golden, Colorado. Occasionally, the big boys behave less covertly. Witness SAB/Miller's test marketing of the Miller Lite Brewers Collection, a trio of low-cal, low-carb 'craft-style' beers in four markets including Baltimore, Maryland. They began this in February; I haven't yet had the gumption to buy a sixer. Just last week, Anheuser-Busch (A-B) announced plans to brew Budweiser American Ale: no test markets but a scheduled autumn nationwide release. A-B Vice President of Marketing Dave Peacock said that the concept is "very appealing" to consumers and it "improves the Budweiser image and validates our Great American Lager positioning for the mother brand." More flavor being "very appealing"? More flavor improving the image of "the mother brand"? Is there an implication about a lack of flavor? Say it ain't so! Bud Light drinkers, who dislike what they might describe as the 'heavy and bitter' flavors of craft beers? Craft beer drinkers, of whom a substantial minority have an almost somatic antipathy for anything 'mainstream'? In the mid 1990s, Miller brewed a beer simply called "Miller", a beer so 'unique' that the brewery was willing to put its very name on the label—or words to some such effect. Even more of a scream were the ingredients Miller claimed to use in making this eponymous beer: "We only use the 'heart of the hops'." Miller—The Beer was so special, it quickly became merely a memory; and ever since, botanists have been searching for its elusive piece of agricultural anatomy. For that matter, does anyone remember Budweiser Red? The more I think about so-called binge drinking, the more I think it is a result of the Northern European [and hence, American] attitude to work — the weekend feels like the only time people can really relax, after slogging through five or six days of boredom, stress, and aggravation, and they want it to be something special, memorable and overwhelming. Fran Kubelik: They sent me to secretarial school, and then I applied for a job at "Consolidated". Then I flunked the typing test. Fran Kubelik: No. I can type up a storm ... I just can't spell. More from Boakandbailey: "Binge drinking is not the problem — it’s a symptom." All you female bloggers - convince the men in your lives to cook a meal, then post it on your blogs. For all the men who are already cooking, good on you - post something fun on your blog. When you post something, let me know in the comments here or in an e-mail. If you don't have a blog e-mail me a picture and description of what you've cooked. Do this by next Sunday, March 30 and I'll compile all the responses here. Feel free to grab the graphic above and use it in your posts. Happy cooking! In a cruel twist of fate, a couple of the very worst veggie offenders rank among the culinary elite of vegetables. Both the slender asparagus and the portly artichoke can be self-centered, often leaving their wine partners tasting strangely off-balance and askew. 1) Pan-toast a small handful of sesame seeds over medium-high heat in dry pan until fragrant (not burned!). Heat a pan and melt 4 TBSP margarine over medium-low heat. Slowly blend in 4 TBSP potato starch, whisking constantly until thoroughly mixed. Continue to cook, whisking, until the flour and margarine achieve a copper color. Set aside. In small pot, heat 1 TBSP extra virgin olive oil. sauté 1/2 cup finely minced onions over medium-low heat until translucent. Add 1 TBSP minced garlic (and more oil if necessary); sauté until fragrant. Remove from heat. Add to blender or food processor with 12 oz silken tofu, 2 TBSP lemon juice, 4 TBSP vegetable stock, 1 tsp dry mustard powder, 1 tsp freshly cracked nutmeg, 1/2 tsp turmeric, 1 tsp kosher salt. Take half-pound of asparagus. Cut of stems; trim woody stalks. Place in bowl and toss with 2 TBSP virgin olive oil, 1 tsp Kosher salt, and 1 tsp freshly cracked black pepper. Place prepared asparagus on foiled baking sheet. Set oven to 425°F. Roast for 10 minutes. Remove from oven. Top with dollop of mock hollandaise sauce. Sprinkle with toasted sesame seeds. The 3rd round of the Washington Post's Beer Madness has been announced: out of 32 beers, an elite 8 remain. And of the 8 local beers originally selected—meaning those from Baltimore, D.C., Virginia, and Delaware—4 remain, thus making up 50% of the semifinalists. Last year's winner—Brooklyn Lager—was eliminated by local boy Flying Dog Old Scratch Lager. And, yes, Flying Dog is indeed DC/Maryland local. The former Denver, Colorado brewery has moved its brewing operations into the old Frederick/Blue Ridge Brewing digs in Frederick, Maryland. This non-scientific competition is for bottled beer only: no draft, or casks, or even growlers of brewpub beers for that matter. Another aspect of the format has confused many observers. The beers are being judged, and advanced or eliminated, by ten panelists previously selected by the Washington Post. The website, however, shows the tally for the on-line (non-binding)voting, which in many cases contradicts those results. For next year's competition, I would suggest that the Post select only 9 judges, and use the on-line votes as the '10th' judge. Many good-beer partisans will know what the latest 'quadruple wet-hopped 20% abv thingy' is, yet may not know who Don Barkley is, or Jack McAuliffe. Barkley and McAuliffe were and are pioneers of the American good beer renaissance. Beer is liquid history. Not knowing beer's history is not knowing beer. Don Barkley, arguably the closest active link to America’s original microbrewery, is returning to small-scale brewing. The North Bay Business Journal has the scoop. Visionaries from Mendocino County are looking to break down the walls between fine wine and craft beer in wine country. Don Barkley, a legend in U.S. craft brewing, left his post as master brewer at Ukiah-based Mendocino Brewing Co. in November and is preparing the inaugural releases this spring from a rare winery-brewery in south Napa. Barkley worked for Jack McAuliffe in the 1970s at New Albion Brewing in Sonoma County shortly after McAuliffe started the first “built new” (it wasn’t really new) microbrewery. Last April when the Brewers Association honored the reclusive McAuliffe it was Barkley who accepted the award. Mr. Barkley plans to release wheat beer, pale ale and amber ale under the label Napa Smith Brewing Co., named after the ownership, Napa mortgage broker Kathy Smith and her family. She acquired the former Hakusan sake winery at the intersection of highways 12 and 29 in March 2006. Mr. Barkley, 53, said he made the move from Mendocino Brewing Co. to Napa Smith Brewing Co. to get back to his roots with his family, his brewmaking and his customers. He’s working with a 15-barrel batch brewery versus a 100-barrel one in Hopland. And he misses the feedback he used to get from customers before Mendocino Brewing Co. production facility was moved out of the Hopland brewpub to Ukiah in 1997. “Jack McAuliffe’s favorite comment was winemakers are poets and beer makers are industrialists,” Mr. Barkley said about the iconic founder New Albion Brewery in Sonoma. “We’re going to see whether an industrialist can become a poet.” About 1,000 barrels of Napa Smith beer will be filled in 22-ounce bottles and marketed to local fine restaurants at about $4 each. I may sell beer, but I do not believe it merely a 'product'. 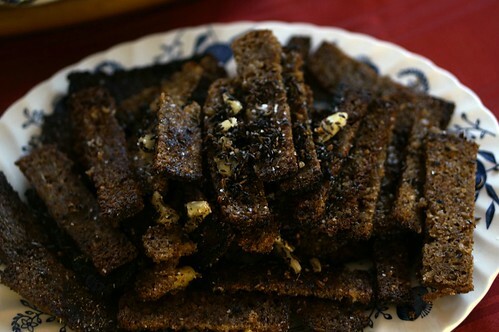 Lithuanian Kepta Duona," literally, "cooked bread": strips of coarse, dense rye bread, pan-fried in oil with caraway seeds, then rubbed with garlic cloves and salt. Served as “užkandžiai prie alaus” — “snacks to beer”. Boak & Bailey — a pair of British beer bloggers based in London— posted a recipe for Lithuanian "snacks to beer" last summer. Better late than never, I'm reposting it here and now. Garlicky fried bread strips: It’s not remotely fancy, it’s not good for you, but it’s a great snack to beer for several reasons. Firstly, it’s salty and oily. Now, I know greasy is bad for your beer. It makes it go flat. But, frankly, who cares — it just works. Eat, dipping in majonezas (mayonnaise), or not. Serve with "a big glass of fizzy lager," or not. An ale would fare just as well. Snacks to beer: a hearty salutation, indeed. 1. Cut some rye bread into fingers (or “soldiers” for those of you who like a dippy egg). It’s easy to get rye bread in London now, because Polish and Lithuanian migrants have established a demand. If you can’t get it, any dark brown bread – wholemeal, or maybe even something with nuts in – should do the job. 2. Rub each finger with a crushed garlic clove. One clove will do ten or so fingers before it disintegrates in your fingers. 3. Heat some oil in a pan. Get it smoking hot. You’ll want about four or five tablespoons for ten fingers of bread. We used olive oil, because we’re complete ponces, but I suspect the Lithuanians use pork drippings. 4. Sprinkle in some caraway seeds – about half a teaspoon. They’ll snap, crackle and pop. 5. Lay the bread carefully in the oil and leave it on one side for 1–2 minutes. 6. Turn it all over. It should almost be turning black. Sprinkle quite liberally with salt. 7. After another minute or so, tip the whole lot out onto a piece of kitchen towel to drain. 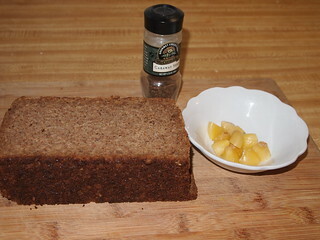 Do not use the soft rye bread we ubiquitously see here in the States, but rather the dense, dark, wonderful stuff: homemade and store-bought. Vegan mayonnaise: homemade and store-bought. 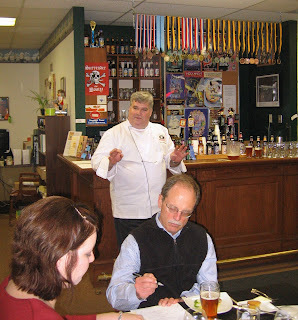 I recently contributed an auction item for a charity fundraiser: an at-your-house seminar on cheese-with-beer. A Virginia winemaker bid on it and won. He had been intrigued and challenged by my description of the item: Beer is the New Wine. Diary of a Brewer's Hugh Sisson recently blogged the third installment of his series: Beer is the New Wine. 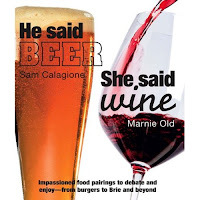 He Said Beer, She Said Wine: Impassioned Food Pairings to Debate and Enjoy -- From Burgers to Brie and Beyond. 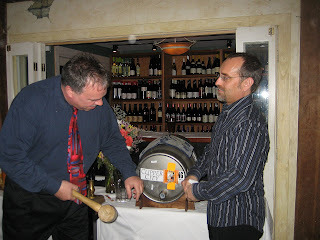 In this promotional video for the book, Old and Calagione banter about their series of Wine vs. Beer Dinners, at which they had paired each course with both a beer and a wine, and asked the participants to indicate which succeeded, tastefully. In the DC/Baltimore area, to date only Chef Gillian Clark's Colorado Kitchen has hosted a similar Wine vs. Beer Dinner: Battle of the Barrels. So is 'beer the new wine'? As Stan Hieronymus said: "New Beer Rule #7: Beer is still beer." As I said: "that's creeping wine envy." So, what's in a name? That which we call a beer, by any other name, would taste as pleasing. Since tonight is 'guilty until proven innocent' night —aka Saint Patrick's Day/Night and sobriety roadblocks set up all over— I'll be staying right here at home, thank you very much! I cooked up some Beer Risotto last evening. It'll be delicious again tonight, pan-fried with a few dollops of olive oil. Pasta may be the go-to food for many; it's Risotto for me. Risotto (borrowing from Wikipedia) is a "traditional Italian rice dish cooked with broth and flavored with parmesan cheese and other ingredients, which can include meat, fish, or vegetables." My rule of thumb for risotto is 2-to-1 stock to arborio rice. And always use arborio rice. I always have plenty of home-made veggie stock on hand, frozen into ice-cubes. Add to that 3 ounces of a Vienna-style Lager per cup of rice. I use Balto MärzHon from Clipper City Brewing. Failing that, use an amber lager with at least a good hint of toasted malt character. I usually add frozen peas near the end of the cooking process, but fresh asparagus, diced into small pieces, is delicious. I skip the Parmesan cheese, substituting with 'cheesy' nutritional yeast, sprinkled on top, when serving. and ... don't forget the Marmite! For more of the recipe and procedures, go here. In late 2007, the Virginia Department of Alcoholic Beverage Control ruled that I couldn't pour you a beer. To be precise, it wasn't only me, of course, but any brewery representative that was forbidden from pouring a sample of beer for a customer at a wine/beer shop or supermarket. We brewery representatives were even told not to be present when a sampling was occurring! An exception was at any store which also held a 'restaurant' license, known in the trade as an on-premise permit. Relief for my livelihood was needed. And it happened this past Thursday. Allows gourmet shop licensees to give samples of wine or beer at tastings sponsored by the licensee for its customers for on-premises consumption. Additionally, with the consent of the licensee, farm wineries, wineries, breweries, and wholesale licensees may participate in tastings held by licensees authorized to conduct tastings, including the pouring of samples to any person to whom alcoholic beverages may be lawfully sold. The bill contains an emergency clause. That emergency clause allowed the changes to go into effect the very second the Governor signed the bill. When you see me next, I will pour you a beer— a one ounce sample, that is. Thank you, Delegate Ward and Governor Kaine. Yes, Virginia, there is a beery clause. Jump here for a report of other changes to Virginia alcohol laws. Congratulations to Philadelphia and its beer drinkers! Philly Beer Week—a region-wide celebration of good beer— eventually grew to 2 weeks. It concluded last evening. According to this first post mortem, by Lew Bryson, it was indeed "one for the books." I wasn't able to attend, but reports from associates and friends were nothing but positive and enthusiastic. Why was it such a success? For one thing, Philly-area beer drinkers and retailers support LOCAL beer. And have pride in it. Bar owners there call it the 90-mile rule. That's the imaginary radius they draw; to the breweries within its circle, they offer their loyal support. Is there beer in Philadelphia bars from elsewhere, from cross-continent, or overseas? Of course! There's much and a great variety. But there exists a fierce local pride and consequent local quality. Could there be a Washington/Baltimore Beer Week? Yes. Would it be of similar depth and breadth? I don't know. Go to Opening Night at Nationals Park. Count the number of local beers. I'll save you the trouble. The number at the ballpark will be ... ZERO. It's a 50 mile bicycle jaunt from the Washington Monument to the terminus of the paved Washington & Old Dominion Trail in Purcellville, Virginia. And sitting there, a few yards from the trail, is the outdoor patio of Magnolias at the Mill, a Purcellville restaurant and beer pub. During her event-full week in the DC/VA/Baltimore area, Lucy Saunders accepted a luncheon invitation from the restaurant's Executive Chef Mark Marrocco and Manager Kim Ross. So one afternoon, we were there at Maggie's, sipping on beer—Lucy, a Stoudt's Scarlet Lady, I, a Bell's Two-Hearted Ale—and enjoying a special tasting menu Chef Marrocco had prepared. The photo to the upper left is of Tempura Rockfish with capers and aioli, on a bench of house-cut fries. Now, to the right, look at the veggie zucchini version—faux Rockfish—that Chef Marrocco made for me. Very clever and very tasty! I return to Magnolias—without Ms. Saunders, but with the brewing team from Clipper City— on Thursday, 22 May, for a Clipper City Beer Dinner. Mark, Kim, and I are working on the details. Details here on the Organic Beer Dinner. The 2nd round of the Washington Post's Beer Madness has been announced: 32 beers winnowed down to a sweet 16. Out of 8 local beers—those from Baltimore, D.C., and Virginia (and stretching to Delaware)—5 were carried forward. One match-up was plainly unfair: Dominion's Pale Ale versus Dogfish Head 60-Minute IPA. The latter entrant, more flavorful, easily won. A contest between Dominion Pale Ale and Dogfish Shelter Pale Ale would have made more sense. And, as both beers were from local breweries, the pairing was preordained to knock out a local entrant. One local beer was a sentimental choice, and, really a ringer. National Bohemian, once the choice of 3 out of 4 beer-drinkers in Baltimore, is no longer brewed there, but by the international brewing conglomerate SAB/Miller. And, really people, shouldn't beer drinking be fun? [UPDATE: 2008.03.22: Elite 8 announced. We watched No Country for Old Men last night. The film depicted (very) graphic violence when such furthered the plot line, but implied the violence when that depiction would have been superfluous or gratuitous. The non-ending ending took this Western-murder-thriller into the (infinitely) broader enigma of life and its purpose. The film indeed deserved its Oscar awards. Llewelyn Moss: "I know what beer leads to." Woman sitting at motel pool: "Beer leads to more beer." Afterwards, I sipped on one Dogfish Head 90-Minute IPA. Arlington, Va: While I've had friends give me the "bacon" reaction from the Schlenkerla smoked beers, it's not really fair. Both bacon and Rauchbeer are smoked so they have a similar character. This vegetarian loves smoked beer but doesn't really associate it with bacon. Greg Kitsock: Actually, brewer Chris Rafferty of the Rock Bottom in Ballston did offer a very good version of a Bamberger Rauchbier last November. That was part of an on-line exchange on Monday at WashingtonPost.com between Beer Columnist Greg Kitsock and Sunday Source Editor Joe Heim—the organizers of the Post's March Beer Madness Competition—and on-line participants. the controversy mostly boils down to complaints about beers that weren't included in the contest and about some that were. Here's our rationale which I hope will nip this in the bud: We didn't want this to be a beer snob contest, so we included a number of mainstream (or, as snobs refer to them, swill)brews in the mix to see how they would stack up against higher end beers. We make absolutely no apologies for doing this as we think it adds to the fun of the whole thing. And, really people, shouldn't beer drinking be fun? Great Lakes doesn't distribute in our area; I've occasionally seen Three Floyds beers, but their availability is very sporadic. Both are first-class breweries, and I wish we could have included a representative from each. Transcript of the on-line discussion here. My post on Beer Madness here. Like many others who take pleasure in food and drink, I have a somewhat robust gustatory memory (as opposed to my short term memory, which is itself fading fast). And, I do remember my first Aecht Schlenkerla Ur-bock. In fact, I was a late convert, perhaps 1990 or 1991. One autumn evening, I was tasting unfamiliar beers at the Brickskeller in Washington, DC with a female companion and Jim Dorsch. Jim was then a contributor to the BarleyCorn, predecessor to the Mid-Atlantic Brewing News. Both my friend and I at first turned up our noses at Jim's proffer of his smoky, meaty Rauchbier. But we both, eventually, trepidatiously, sipped. And when we went to sip again, Jim politely suggested that we buy our own. We did, and were hooked. She went on to sell gourmet foods in Washington, DC; and I, beer—including, for awhile, Schlenkerla. Many Baltimore/DC-ers also have fond if bittersweet (or would that be smoky) memories of the late DeGroen's pungent and malty Rauchbier, since it is, alas, no longer brewed. I recently had a discussion with a beer partisan—really more of a monologue by me— about the often repeated yet incorrect comparison of pinnacle-of-fresh 'wet-hopped' beers to wine's jejune Beaujolais Nouveau. Orval elevates beer to a level of wine in that it can age, and change, and be a different beer. In a way that is what we are trying to do with a lot of our beers. I don't mean to call out that beer partisan, a fan of good beer, or Mr. Cilurzo, a brewer of good beer, but we beer enthusiasts need to get over our creeping wine envy. Wine is wine. Beer is beer; it's a damn fine beverage all by itself. There is no need to 'embiggen' beer by elevating it to a state of almost being like wine. Doing so, indeed, diminishes beer. Heironymous in turn mentioned a post by Lew Bryson. Lew had recently drunk the Trappist beer Orval, while over there, in Europe. At his blog, he figuratively exclaimed—"I've never had this beer before"—astonished by the beer's freshness. Others usually extol Orval only after wine-ishly aging it. I delight—back here in the USA—in Orval with all of its feral Brettanomyces yeast character and hoppy dryness. But I envy Mr. Bryson, who tasted it fresh! LONDON (Reuters) - Drinking alcohol, even moderate amounts, may boost blood pressure more than previously thought, British researchers said on Tuesday. WASHINGTON (Reuters) - People who started drinking in middle age were 38 percent less likely to have a heart attack or other serious heart event than abstainers -- even if they were overweight, had diabetes, high blood pressure or other heart risks, Dr. Dana King of the Medical University of South Carolina in Charleston and colleagues found. 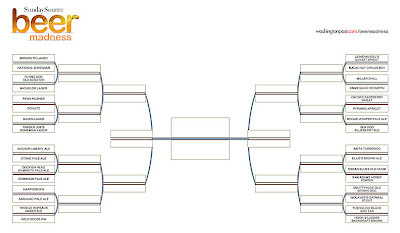 The initial brackets of the 2nd annual Washington Post Beer Madness appeared in the paper's Sunday Source section this morning. The Post's beer columnist Greg Kitsock (also the editor of the Mid-Atlantic Brewing News) and The Sunday Source's Joe Heim selected the initial 32 beers. On the upper right side of the brackets in the Specialty/Fruit match-ups, my brewery's Oxford Raspberry Wheat is paired against Pyramid's Apricot Weizen . The 10 panelists, who will judge the beers, were chosen based upon their on-line submissions. I had submitted: "I sell beer, and I wear a tie." I wasn't chosen. Conflict of interest, maybe? On-line, it's interactive: you can match wits with the judge panelists. My earlier post about Beer Madness is here. On Tuesday 11 March, I'll be discussing "Drink fresh, drink local" at the Whole Foods Market in Tysons Corner. It's a timely topic, I believe, in light of concurrently rising beer prices and worsening overall economic conditions. The hour-long presentation won't be all gloom and doom, however. Manager Jeff Forrest will be pouring five Clipper City beers and pairing them with 5 artisinal cheeses. There's no cost, but please call the store to reserve a seat for the 7pm tasting: 703.448.1600. Shawn Malone and Patrick Dinh of Tuscarora Mill in Leesburg, Virginia — General Manager and Executive Chef, respectively — hosted chef and cookbook author Lucy Saunders last evening with a dinner and double cask tapping. Special guest was Clipper City Brewing's General Partner Hugh Sisson who brought along 6 of his beers, including two casks. 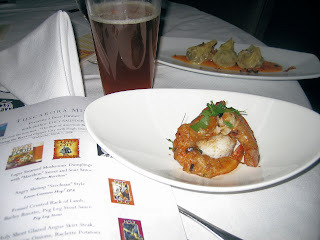 Chef Patrick Dinh 'tweaked' the recipes in Ms Saunders' cookbook— Best of American Beer & Food — creating a menu with Asian flair while not being overtly Asian food. Later this week, I'll re-post in more detail. The shrimp had an elegant spiciness with a good concentration of flavor. Shawn paired it with Clipper City's Loose Cannon Hop3 Ale, pulled fresh via handpump from a 'pin' cask. The beer's hoppiness complemented the dish's spice. In the background is the starter course: Lager Steamed Mushroom Dumplings with Balto MärzHon Sweet and Sour Sauce. It was paired — naturally — with Clipper City's Balto MärzHon. The flavorful sauce, made with the beer, added interest. Next up was Fennel Crusted Rack of Lamb, with Barley Risotto and Peg Leg Stout Sauce, served with a 2nd fresh cask, but of Peg Leg Imperial Stout. There were many audible oohs and aahs — and empty plates — accompanying this course and compliments on the quality of the lamb itself and the seasoning. During the week, Lucy Saunders had mentioned several times that fennel seems to be a flavor inherent to the fermentation of beer itself. I often am told that I expound at length about the freshness of cask ale. This evening was no exception, freshness being indeed the meme of beer. And several diners did come up to me afterward to remark on how they now understood the fuss about freshness of cask beer. The Skirt Steak was an adaptation of the Short Ribs recipe in Ms. Saunder's book. The onion seasoned with cumin and peppers brought complexity to the richness of the meat. I had recommended raclette potatoes to Chef Dinh ... and he ran with the idea! A blue cheese from Wisconsin provided a digestif pause before dessert: a sheep's milk blue cheese from Shepherd's Way Dairy in Minnesota, served with a smear of pear coulis. Shawn paired it with Clipper City's Below Decks Barleywine, 2007 vintage. To my palate, malt-forward barleywines and blue cheeses are wonderful flavor-dancing partners. For a pre-dinner planning session, I had managed to find a case of last summer's Hang Ten -- a 10% alcohol by volume (abv) weizen dopplebock. Tasting it, Patrick immediately exclaimed, "This is for dessert!" And so it was! 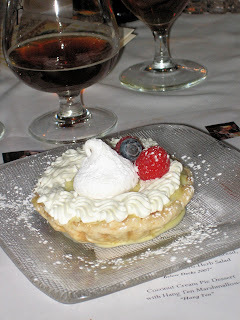 He prepared a Coconut Cream Pie, which mated deliciously with the beer's banana and fruity esters, sweet cooking spice aromas, and low-tuned fruit maltiness. Together, they accentuated spiciness while smoothing out the luxurious sweetness. The pie was topped with beer-marshamallows (! ), the recipe for which is in Ms. Saunders book. 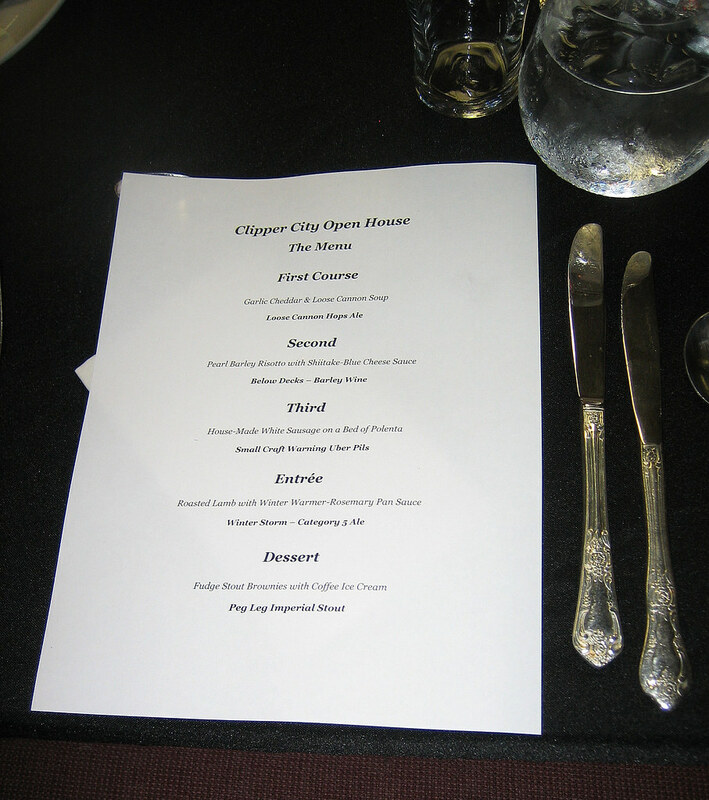 Hearty applause welcomed Chef Dinh and staff, Shawn Malone, Lucy Saunders, and Hugh Sisson at the dinner's conclusion. Lucy signed several copies of her books Grilling with Beer and Best of American Beer & Food. By the way, as I am a vegetarian, I did not partake of several of the dishes, but certainly did observe and inquire. 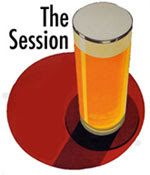 During the evening, I had the opportunity to sit with Dave Turley, author of the beer blog Musings Over a Pint. We two bloggers had a very enjoyable chat. Go here for the complete menu, and here for more photos. Earlier in the day, Ms. Saunders and I had traveled a dozen miles further west for a special lunch at Tuskies' sister restaurant in Purcellville: Magnolias at the Mill. Go here for that.